Rule 12 is a post-nuked total conversion for Morrowind. It is currently is the middle stages of development. Set in a post-nuclear-war era, full of irradiated grit and grime, Rule 12 is designed to be a true RPG, filled with all kinds of people and places. The world spans many areas, including a bomb crater, multiple cities and bases, and the Badlands, a jagged expanse of inhospitable terrain left to the toughest, roughest characters in the country. Rule 12 is built on the Morrowind engine, but some major mechanics are changed. Characters have abilities, which can be learned and trained in, and allow special actions. Inventory is limited both by weight of items and by limits on the number of each type, affected by stats (eg, a weak character can only carry one rifle and one pistol, a strong character could have two of each). Unfortunately, due to attempts at realism, this mod isn't for the young'uns. 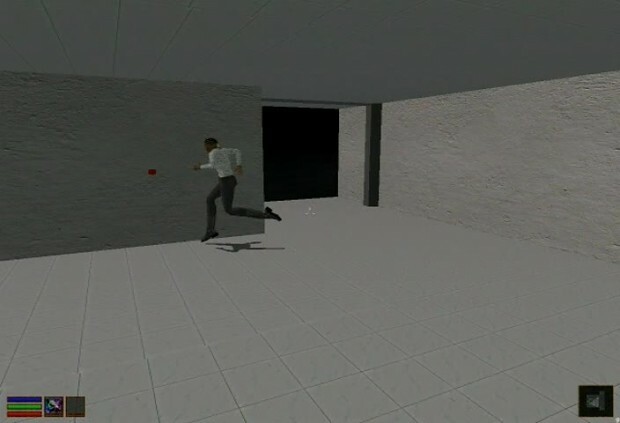 A demo of how the EpLab worker's AI makes him pick the nearest alarm panel (there is one on the opposite wall as well), run towards it, and trigger the alarm. The trigger then enables the lights and closes the blast doors (light models not placed yet).